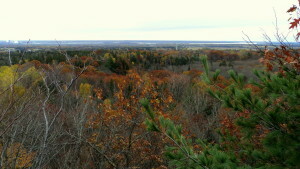 This is a short loop that includes a bluff with a lookout over the city. From Sault Ste. Marie, drive west on Second Line, then turn right (north) onto Allens Side Road. Drive for 1.6km then turn left (west) onto 3rd Line W for 800m and take first right (north) onto Maki Road for 1.8km then turn left (west) onto Mt. Pleasant Court. Park in the turn around at the end of the road, ensuring not to block any private driveways. The trail starts at the parking area. The trail follows the Voyageur Trail for part of the route and then branches off to form the loop. Please bring a map and compass, and be able to find your own way, as there are many trails in this area and it is easy to get lost.